The inspiration for this salad comes from Gourmet Traveller, but the idea of grilling the feta comes from Donna Hay (another salad I love and have made dozens of time). For sumac salt, combine ingredients in a bowl, season to taste with freshly ground pepper and set aside. Preheat oven to 180°C/350°F; line a small baking sheet with foil. Halve half of the tomatoes, place cut-side up on prepared sheet, drizzle with a little olive oil, season with a little sumac salt. Roast until tender (30-35 minutes). Set aside to cool. Meanwhile, place wheat in a saucepan, cover generously with cold water and bring to the boil over medium-high heat. Reduce heat to medium and simmer until tender (35-40 minutes). Drain, refresh under cold running water, then drain well and set aside to cool. Add olive oil and lemon juice (to taste) to the remaining sumac salt in order to make a dressing. Mix well. Heat a non-stick frying pan over high heat. Fry the feta for 1–2 minutes each side or until golden. Chop into large pieces. Halve the remaining tomatoes, mix with the roasted ones and place in a serving dish. Mix in the wheat, feta, basil and parsley. Drizzle with the dressing and serve. i am adoring the simplicity of this dish but the intensive flavors. patricia this looks great! Beautiful and very catchy salad.. This salad is right up my alley! I LOVE sumac and feta cheese I can never say no to! Beautiful! 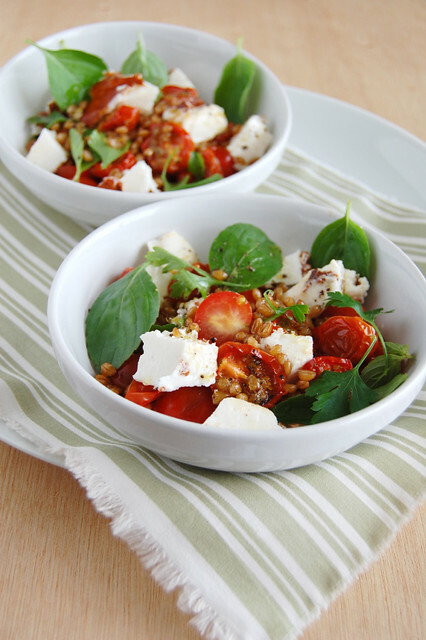 I do not see many salads with Wheat Berries in it, I simply love the combination of wheat, feta, and tomatoes. Lovely. wow, patricia, this looks yummy and light. i love feta and tomatoes. there is almost nothing better! I have never heard of wheat berries, salad looks so nice. I am surprised to see so many salad recipes this time of year. Priya, thank you! The wheat adds a nice chewy touch. It already seems like ages ago since we last had beautiful tomatoes like that! It's not summer in New England anymore, but I'm going to try this with my slow-roasted tomatoes. I love wheat berries!! This looks delicious. I love all the fresh basil!